Geoelectric investigation using vertical electrical sounding (VES) (Schlumberger electrode configuration) was carried out in 14 locations at Ninth Mile area, southeastern Nigeria to determine the variations and interrelationship of some geoelectric and geohydraulic parameters of a sandstone hydrolithofacies. The measured resistivity data were interpreted using manual and computer software packages, which gave the resistivity, depth, and thickness for each layer within the maximum current electrodes separation. The aquifer resistivity values range from 86.56 to 4753.0 Ωm with 1669.40 Ωm average value. The values of water resistivity from borehole locations close to the sounding points range from 79.49 to 454 .55 Ωm and averaging about 264.7 Ωm. Porosity values of the sandy aquifer range from 30.19 to 34.20%. Fractional porosity values range from 0.3019 to 0.3292, while the tortuosity values vary between 2.91 and 22.85. The geohydraulic parameters estimated vary across the study area. Formation factor ranges from 0.28 to 15.29, hydraulic conductivity ranges from 1.21 to 66.54 m/day which, however, influences the natural flow of water in the aquifer while tortuosity values range from 2.91 to 23.27. The contour maps clearly show the variation of these parameters in the subsurface and the plots show their relationship and high correlation coefficients with one another. 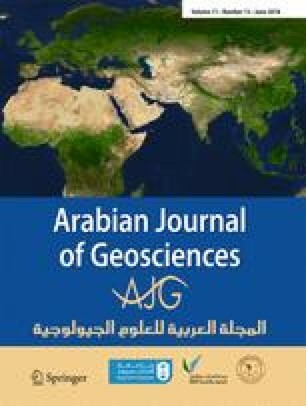 The results of this study have revealed the geological characteristics of the subsurface aquifer, established the influence on the amount of groundwater, and proposed a strategy for the management and exploitation of groundwater resources in the area and other aquiferous formations. The authors are grateful to their families for their support and encouragement. The editor and reviewers are also acknowledged.